Sadowska says that when shooting lingerie or boudoir photographs, it’s important to find a model with enough confidence to remain relaxed while showing a bit of skin. When less secure models “hide” and cover their bodies, it’s difficult to capture pleasing images. Sadowska begins by having her model strike a number of poses that elongate her body and accentuate her features. You’ll see why maintaining a relatively straight back makes a model seem taller and more confident. With these and the other posing tips Sadowska provides, you’ll be able to better capture pleasing photos that make you and your model proud. It may take you both some practice, but the results will be well worth the effort. 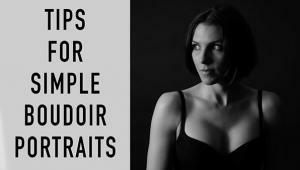 There are more portrait photography tips on Sadowska’s YouTube channel. And we encourage you to check out her earlier shootout, comparing premium 24-70mm f/2.8 zoom lenses from Canon and Sigma. If you're interested in Boudoir photography, check out the March issue of Shutterbug, which features an interview with top Boudoir pro Jen Rozenbaum.